LDN series downlights are 0-10V dimmable and are available in open and wallwash configurations. 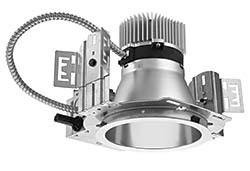 Downlights have lumen outputs of 600, 1,000, 1,500, or 2,000 and a wattage range of 12 to 35 watts. Input voltages of 120V, 277V, or 347V. Color temperature options are 2700K, 3000K, 3500K, or 4000K, with a minimum CRI of 80. Driver is 0-10V dimming capable, and 55-degree cutoff prevents ceiling glare. Mixing chamber provides uniform light output without pixelation, according to the company.